This book offers practical guidance, lesson stimuli and online resources for embedding Philosophy for Children (P4C) into secondary level subjects. Positive Peace in Schools offers a fresh and challenging perspective on the question of conflict, violence and peace in schools. Follow Ramadan from one new moon to the next, and experience its beauty and excitement - early morning meals and prayers, visits to the mosque, fasting in the day, Eid celebrations - in this movingly written and stunningly illustrated book. 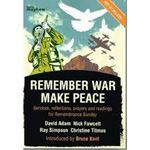 A collection materials for Remembrance Sunday in which all casualties of war are remembered, with an emphasis on peace. This picture book tells the story of 10-year-old refugee Ali who, accompanied by his grandmother, flees his home country of Afghanistan to avoid the conflict caused by war. Written by a clinical psychologist with over 25 years' experience of family therapy, this book arms parents with the tools and advice needed to create positive sibling relationships.